We service all states in the US. We have created one-of-a- kind masterpieces in areas such as Aspen, Telluride, Crested Butte, Durango, Denver, Colorado Springs, Park City, Salt Lake, Idaho Falls and all over Wyoming among many other states. We specialize in being a one-stop shop for our customers. We want to make the process as easy and as satisfactory as possible for all of our clients. What is your professional background? How did you get started in your field? I’ve been in the trade since I was 17. I trained under a master craftsman and knew that I’d found the right field for me. I love creating unique designs and crafting products by hand. It’s inspiring to help clients make their homes a very special, one-of-a- kind place. That’s a hard question. Each project is unique and has its own personal style. That’s what I love about what I do—each project is a different challenge and a new opportunity to create and collaborate with clients. My specialties in-house are far and broad. Because StoneWorks is independently owned, we can provide a personal touch to each project. We take great pride in our work, and we understand that craftsmanship is an art—we are committed to helping our clients achieve something of timeless beauty and style. Do you work with small-scale as well as large-scale projects? We work on all scales and we always do the best we can do regardless the size or scope of the project. We pay attention to the intricacies of each project no matter the size. Do you have a favorite product that you carry? I think all products are equally beautiful. Choosing the right product depends on the client, the client’s vision, desires, and budget. We are dealing with products that carry unique qualities of color, size, thickness, and texture. My favorite products and designs are anything unique and bold! What are some special considerations you need to take in your craft? I always remember to take my time with each project and do it right the first time. The products we use are hard, soft, and brittle. They have natural fissures and are unique and fragile like our bodies or the planet itself. We take care when working with our products. What words to people use to describe you or your work? I most often hear the words “artist, a real craftsman, and meticulous.” I’m proud of the amount of repeat customers and referrals we get. That means the most to me. I enjoy the final product when the project is complete and the customer is happy with the end result. What would you be doing if you weren’t with StoneWorks? I wouldn’t to do anything else as a trade! I could maybe see myself as a developer/builder or stone sculptor. But if I could figure out a way to travel for a living— that’d be good too. What sports or activities do you do? My favorite sport is snowboarding. But I love all sports that get me into the vast outdoors. What place do you find inspirational? Brazil is incredible for the stone that is pulled out of the earth and from under water to create dynamic surfaces for us all to enjoy. I would love to travel the world and look at it from a mason’s perspective. We have such amazing masonry feats around the world. Why did you choose to settle in Jackson Hole? I live here for the great seasons we have. Living in Jackson is like being on vacation all the time. StoneWorks of Jackson Hole provides full-service custom tile and stone fabrication and installation. The pros at StoneWorks can help clients at every stage of their project from choosing the right products, preparing existing surfaces for installation, reworking stone to ensure customer satisfaction, and installing. Each associate is trained to produce precise hand-quality laminating and finishing details to exceed industry standards. StoneWorks installers take pride in their craftsmanship and will insure satisfaction in the finished product. 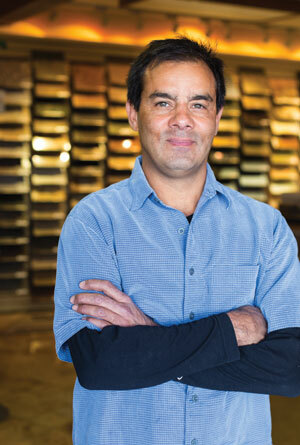 Neal Arguello, owner of StoneWorks, says, “Our motto at StoneWorks is ‘Do it right the first time’ and we approach every project with that commitment.” Arguello cut his teeth as a craftsman in the high-end markets like Aspen and Vail—environments where custom work is the norm and expectations are high. He brings that same commitment to his business the similar environs of Jackson Hole.